The hidden charm house with only three rooms designed by Japanese architect. Perfect location in center of Asakusa, nearby both Tokyo Metro and JR stations. Free WiFi, Chauffeur, Concierge. All three rooms are with tatami mat but not en-suite. A shower room and a toilet are shared with other guests, they are not attached to any room but located in common area (on ground floor). Yes, Tokyo Ryokan has only 3 guest rooms on 1st floor (which is 2nd floor in Japanese way of counting floors). Child/Baby is same rate as Adult, and below (private facilities) is recommended to book. Non smoking anywhere inside house. Each room is Japanese style room with futon on tatami mat. A shower room and a toilet are not directly attached in your room/s but all for your use, not shared with other guests. Japanese style lounge (comfortable living room) with books and origami papers are also yours (on ground floor). 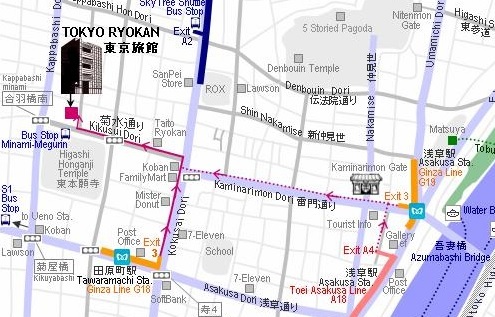 Chauffeur and private-tour is available while you are at Tokyo Ryokan. Child/Baby is same rate as Adult, and this way with private facilities is recommended to book. 36 min. on Keikyu Line and Toei Asakusa Line (direct through-train) 620yen (from international terminal).